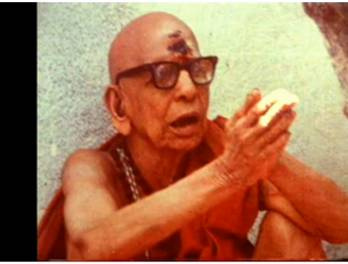 Kanchi Sri Maha Periva: How important is Satsang? Securing a Satsang - good companionship (company of a Sadhu/Mahaatma) in the world is very rare indeed. People are very materialistic and worldly. From amongst these, to find satsang is rare and then to be spiritually oriented is rarer. It is rare indeed to find performances of the prescribed rituals, meditation, penance or some other kind of worship amongst those who believe in the presence of God. And in worship, too, there are different kinds. In this, ‘sattvic upaasana’ is rare. Sadhana should not be done with pride – egoistically. You may chant the Lord’s Name crores of times. You will only attain siddhi (ability to perform rare feats) through this. You may surpass Hiranyakashipu, Raavana, who are called ‘tapolobigal’ (one who will not spend their penance for the benefit of others). While Mahaans will spend their tapas for the good of others, these people will not. People may do ‘Naama sankirtana’, ‘yoga’ and there are those who perform wonderful siddhis and hypnotize people through them. But to see a ‘Jivan mukta’ is very rare indeed!